Last April 11, 2018, CD Projekt RED released a patch for the HDR support of Witcher 3 on the PS4 Pro. But players found new bugs regarding this patch that made the game look and play really bad, such as frame rate drops and draw distance failure. We have covered the bugs found by players, and now it seems that a community leader from the company gave out words of reassurance that a patch for the bugs is already on the way. He confirms Twitter user @A3rnout that the fix is already being developed. No other information was released at this time. Well I have tried the new update and initially the impression was quite good. Fps seems even improved in the infamous swamp area. So I have an idea: try the torchlight because if I remember correctly it gives some fps trouble to the ps4 base before the patch. Sadly, I encountered really notable fps problem, especially in the cave area and when I said problem I mean something really similar to the locked 20 fps issue. Any other or is just me? Man that’s discouraging encounter such issue at every update. Draw distance looks terrible after that patch. It was much better on my original PS4 when i played this game 3 years ago. I have never seen this before. It completely ruins immersion of the game. Plz fix this. 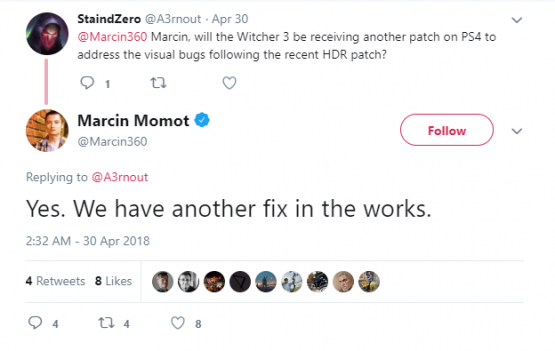 More information regarding the Witcher 3 HDR Support bug patch will available as soon as CD Projekt RED gives more information about it.